Sure, you’re creating fresh content for search engines, but so is everyone else. In such a saturated market, sometimes your title is the only tool you have to attract readers to click on a results page. Make it count. Editor’s note: This article is an excerpt from John’s latest book SEO for Growth: The Ultimate Guide for Marketers, Web Designers & Entrepreneurs. John Jantsch has been called the world's most practical small business expert for consistently delivering real-world, proven small business marketing ideas and strategies. John is a marketing consultant, speaker, and best-selling author of Duct Tape Marketing, Duct Tape Selling, The Commitment Engine, The Referral Engine, and his latest book SEO for Growth: The Ultimate Guide for Marketers, Web Designers & Entrepreneurs. Thank you for the book shout out and for highlighting this section, one of my favorite in the book. The term closed loop is used in a number of industries – so in Engineering it might be a process where product is produced and flow is then recycled, treated, and returned for a new use. The idea here is that you are constantly producing new content with the idea that you will recycle, treat and in some cases find new uses for it. You could certainly make a case that it’s two different things, but what connects them is the new content is planned and produced with this 2nd use in mind. Indeed resorting to feeding the content monster with only new content might turn out to be a very expensive undertaking, especially for a small brand. It ‘s nice to know that there is a way to recycle old content to serve the same purpose as new content. You bet Daniel – it’s not only expensive, it’s exhaustive – one of the things that this mindset produces is a feedback loop where you are exploring and expanding your most engaging and useful content. Thanks for the post! I found recycling an old content is same as re-purposing old content. Though i found the article interested and got to know about the new term closed-circle content loop. Great article, thanks! 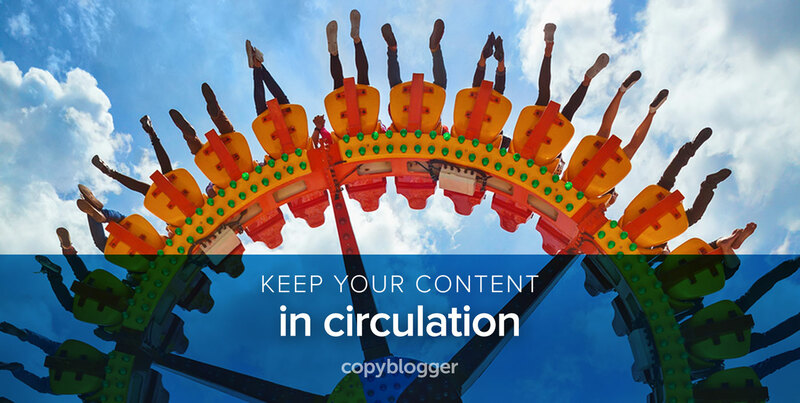 Is the repurposed content always on my blog? Or, is it placed on all the social media outlets with the hopes that’s it’s bringing people to my site? I’ve spent some time trying to write a novel or two, failed, revisited those ideas over 20 years later, and succeeded. So that can happen too, although in the case of web content, the time lapse will be much less than 20 years. I’m just saying in a different way that “failed writing” is never a waste of time or energy, no more than my spectacular failures to play certain songs on the piano two years ago were a waste of time or energy. Now I can nail ’em without even trying. The constant revision inherent in this process will ensure that quality rises. The greatest obstacle I’ve seen to achieving high quality has been lack of time. The best way to self-edit has always been to step away for a while, then look at it again with fresh eyes. Interesting perspective on the two-pronged approach. Something I’ve been experimenting with some of my clients is using their tweetable messages on other platforms such as Instagram with relevant and custom images. I’ve found that since the message is pretty consistent, those updates have received far more shares than any other regular update on Instagram. Good advice! Especially taking one piece of content (eBook, research, articles) and disassemble parts of it to be published elsewhere.